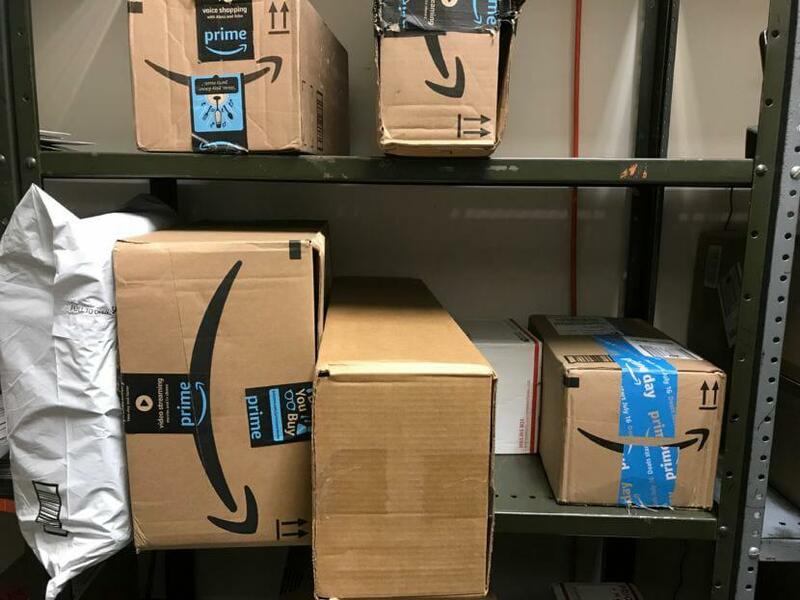 Amazon packages sit on a post office shelf in Sitka. Many Alaska municipalities are grappling with the tax implications of the Supreme Court's Wayfair decision. Fisher recently placed a $976.88 order for product that'll be sold at his store, Redfish Electronics. That's a pretty standard purchase for the local business owner, who buys inventory from Amazon regularly. But at the bottom of his receipt, he notes a relatively new line item. "Got a 'sales tax collected' at $29.32," he says. The charge started popping up on Fisher's receipts in January, and he was taken aback. Alaska doesn't collect a state sales tax, and online purchases have long been exempt from the local three percent sales tax, adopted in 1988. "I was like, 'What's this?' But I needed the product, so I just pushed the button and said 'order,'" says Fisher. "Then, of course, I heard that the city is considering whether or not — or how — to collect this sales tax." Fisher's experience is a pretty common one in the aftermath of South Dakota v. Wayfair, Inc. — a case that was decided by the U.S. Supreme Court last year. The court ruled that states can compel out-of-state sellers to collect their sales tax, overturning the previous requirement that businesses have a physical presence in a state before they're subject to its tax regulations. All across the country, that decision has left online shoppers — and state and local governments — grappling with new tax implications. "We're just feeling this out," says Unalaska City Manager Thomas E. Thomas. "It's all a brand-new thing." Thomas says Amazon is the only online retailer to comply with the court ruling and start charging the local tax. But he says the move sneaked up on city officials just as much as consumers — because so far, the state hasn't compelled out-of-state businesses to collect sales tax. "All of a sudden, Amazon started doing this on their own," he says. "We were looking at doing a study on this that could potentially take a year's time, so Amazon doing this sort of pushed things ahead for us in our thinking." Thomas is referring to an ongoing study led by the Alaska Municipal League (AML). Its goal is to analyze the varied tax policies already in place in cities across Alaska and determine how they might form a single, state-level administration. By forming one authority, Alaska cities could compel out-of-state retailers to collect an online sales tax — in whatever amount they all agreed — and distribute the money back to local governments. But before any consensus was reached, Amazon beat everyone to the punch by collecting individual cities' taxes — from three percent in Unalaska and Skagway to 5 percent in Juneau and 7 percent in Wrangell. Amazon did not respond to KUCB's request for comment. But for now at least, Thomas says online sales tax is something Unalaskans should expect. "Presently, right now," he says. "As we go through it, I don't know — things may change. But right now, this is where it is." What does the city have to say to Unalaskans who feel like they're being hit with a new tax, even though it's one that's long been on the books? "I can only tell them this is an action taken by Amazon," says Thomas. "We're navigating and figuring out how we're going to approach dealing with it. Be patient. We're coming up with a strategy to address the issue." Could the city ask Amazon to stop? "We're working with the city attorney to present some options to the council," he says. "I don't want to say anything definitive on it, but we are working on presenting some options to the council on the issue." Last month, the Unalaska City Council voted 5-1 to require that online retailers collect and remit the local tax — as long as their Alaska sales add up to at least 200 transactions each year and generate $100,000 in gross revenue. That's language taken from the Supreme Court decision, and it should include a number of large online retailers. The city is expecting Amazon to send its first batch of local sales tax revenue by April 30, in keeping with quarterly filing requirements. But it's unclear how much the city will get. "In this community, people shop a lot on Amazon," says Thomas. "Not just residents. Non-residents as well. This place [has been] nearly double the population with all our fisheries and 'A' season, and it'll be interesting to see what kind of revenue we're talking about here." How Unalaska will use that revenue is also undecided. Thomas says it's something councilors still have to discuss. Fisher, the owner of Redfish Electronics, says he'd prefer the money to support local schools or companies in some way. The change may actually benefit local businesses by taking away Amazon's advantage as a sales tax-free retailer. But personally, Fisher says he wishes it wasn't happening. "As a regular old consumer, it was nice to just order and know what the price was without any estimated sales tax," he says. "And frankly, [with the change], it's kind of an unfortunate feeling." The completion of AML's study on online sales tax isn't expected until sometime in 2020. Whatever its final proposal, the organization will have to get cities onboard. So until then, officials say local regulations will prevail. Update: Before the Alaska Municipal League could complete its study, Amazon started collecting sales tax on online purchases made in Unalaska. For more on that development, click here. The Unalaska City Council wants more information before it decides whether to tax local purchases from online retailers like Amazon. That's why councilors voted last week to contribute $5,000 to the Alaska Municipal League (AML). How can Alaska municipalities collect sales tax on online purchases? That’s a question the Alaska Municipal League (AML) has been working on since the 2018 U.S. Supreme Court decision South Dakota v. Wayfair, Inc.
Gov. Mike Dunleavy's proposals for balancing the state's budget include a plan to stop sharing millions of dollars in taxes on commercial fishing with coastal communities. "The message he's sending is that we're out of time and we're out of money," said Matt Shuckerow, Dunleavy's press secretary. The state collects landing and business taxes on fisheries, often referred to as raw fish tax.